Derivatives of basic monomeric structures and polymerizations of materials can be custom produced as well. The field of biomaterial research is always evolving; please contact us if you have a need for a custom synthesis. Ortec operates under strict confidentiality. Whether it's scaling up an existing process, performing ongoing pilot work or exploring alternative synthesis pathways, Ortec stands ready to assist you. We know that process and product development frequently requires a high level of customer interaction. Our technical staff will work closely with you to define the process and specifications. Additionally, these molecules can be used as strategic starting materials for pharmaceutical small molecule synthesis. Please contact us for a full list of products or to discuss your specific application. Ortec can help you foster your product from early process scale-up through full production while maintaining confidentiality. We have the expertise to help you through process validations and qualification, and we've manufactured products under FDA Regulations CFR 210, 211, and 820. We constantly review new regulatory practices to ensure compliance. 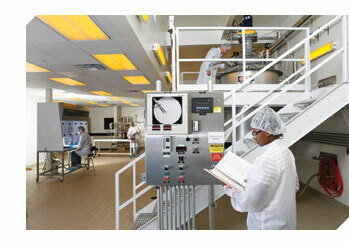 Ortec has dedicated a 35,000 square foot, state-of-the-art facility to our cGMP manufacturing and related services. Located on 30 acres, this plant includes laboratories, pilot manufacturing suites and full-scale production areas. All chemical handling sections are designed as low particulate environments. Our 2,500 square foot clean room is validated to Class 100,000 (ISO 8) and contains USP Water for manufacturing use. The laboratories contain several bench hoods for synthesis and development work as well as an assortment of instrumentation. There are also two isolated pilot and small-scale production lab suites. Each isolated suite contains two walk-in hoods supplied with steam, water, compressed air, and nitrogen.